Open till 15th April 2016. Please complete all questions in full. Applications will be assessed and the successful applicants will be advised. See the full program timeline. Please note: Successful applicants are required to contribute $200 each towards this subsidized program. 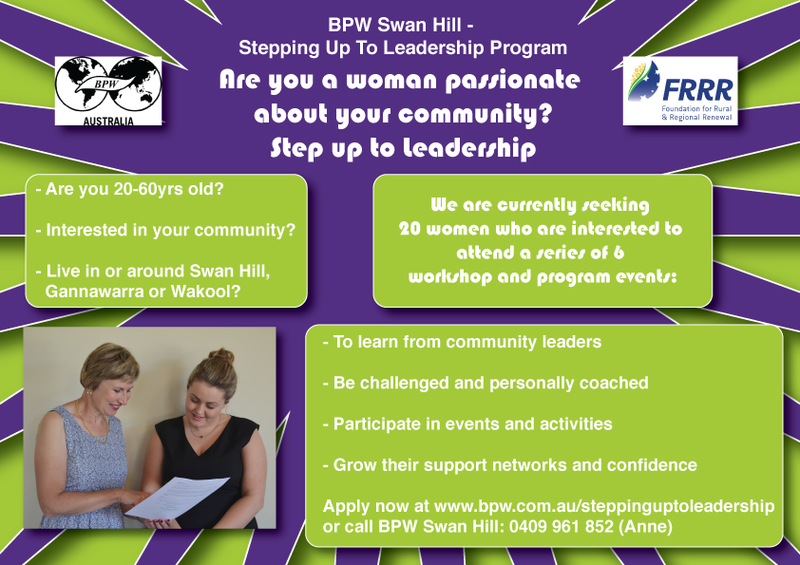 There are 20 places available in the BPW Swan Hill Stepping Up to Leadership Program, funded by the Foundation for Regional and Rural Renewal (FRRR) and delivered locally by BPW Swan Hill. The Program is an ongoing opportunity for women in the region to improve themselves not just in business, but for those interested in our community to Step Up Into Leadership. The confidence to take a leading role isn't easy for all of us. This program will give you the skills and support to do it. Community leaders will share their knowledge throughout the six session program, which will also develop skills in media, public relations and marketing, communityengagement, and advocacy. The program will build participants' self understanding and confidence, and facilitate goal setting and achievement. Women between 20 and 60 years old, living in the Swan Hill, Wakool or Gannawarra region can apply. Applications are now open and close on April 15, 2016 The six session program will run from May 11 to October, with a graduation in November. The program also includes individual coaching sessions with our facilitator, Rosanne Kava. This is a heavily subsidised program made possible by a grant from FRRR. As a result, successful applicants will be required to pay only $200 to participant in this wonderful opportunity. BPW Swan Hill is part of a global organisation with close ties to the United Nations and a leading role in women's issues around the world. This is a heavily subsidised program made possible by a grant from the Foundation for Rural and Regional Renewal, as a result, successful applicants will be required to pay only $200.00 – this is a non-refundable participant fee. A minimum of 80% attendance is required. If a participant is unable to attend an event due to an emergency, a ‘Leave’ letter/email should be sent to the Program Coordinator as soon as possible. Participants are asked to schedule their calendars to enable the attendance requirements to be met. Participants who are unable to achieve the attendance requirements are encouraged to withdraw prior to the program’s commencement enabling a ‘reserve candidate’ to be offered a position in the program. The Step Up to Leadership Committee has determined that it will review the viability of an individual’s continued participation if absences are such that attendance required is at risk.